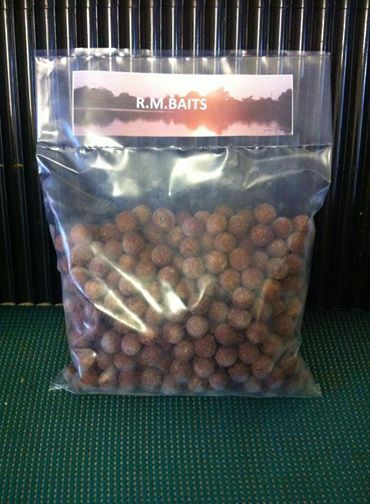 R.M.Baits has been around in some shape of form since the early 1990’s and this fact gives them the advantage of having 25 years of bait making experience, something 90% of todays bait companies cannot come close to !!! Based in the Midlands they have made bait that has caught big fish on a lot of the hardest waters in the country and abroad during the last 3 decades, Horton, kingsmead, Fennemere, Mangrove, Stoneacres, Salagou, Chateau lake, Gran canaria,Sky lakes, the list could go on and on. Today they offer a range of 7 different baits all tried and tested and awesome fish catchers. These include Instinct, Fish mix, birdy mix, milk pro, The Liver, a Winter milk pro and a new Krill mix. Matching pop ups are available for all baits as is a dedicated stick mix for each. New this year is the Oooozze range of liquids available in cream and black pepper, pineapple, scopex, glm, krill, liver, strawberry, and tutti, these are all pva friendly and give off a visual and attractor cloud and can be used to dip pva sticks, boilies or used neat in pva bags, results in testing have been exceptional. The quality of all the ingredients used in their baits is paramount, they will not have them lying around for 6 months before they are used and the vitamin content degrades like some !!! all baits are rolled to order so guaranteeing the angler the freshest bait possible. They also do not produce anything that they would not happily use ourselves and we can be seen doing so on various waters round the country, for example when the waters subside you will find Russ on Linear’s Oxlease trying to catch the big common a fish he has been targeting this last 12 months and lost once already !!!! even fishing over the christmas period he had 18 fish on the winter milk pro mix but no sign of the biggun. We have been Carp anglers for over 35 years and seen all the developments that have taken place in this time and we have over 30 years experience in the design and implementation of carp baits. The knowledge we have between us is vast and available to all in the range of baits products and services that we offer. We will not sell anything that we do not, or will not use ourselves. We do not use "field testers" as we are constantly fishing ourselves. If there is anything we can help you with please do not hesitate to contact us.